As most of you know, I love hot summer weather. Here in South Africa, after about a half-hour of Spring a while ago, it turned into Summer. Yes, I do know it is the first day of Spring/Autumn. 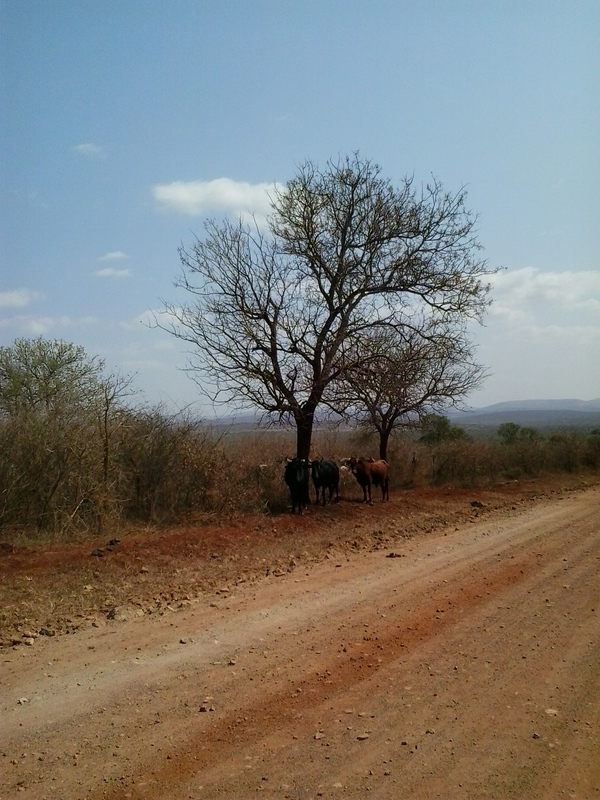 But here in Kwa Zulu Natal province, it is hot, dry, dusty, and very sunny. Both the plants and people are thirsty. There is a water shortage and the Spring rains haven’t arrived yet. I’ve now been at my new house for 3 nights, 3 days. I have an adorable rondaval, painted pink, with tile floors, fresh yellow paint on the walls, a little porch in the front. I cried when I first saw it! It is situated in the large yard of my host family, nearby their home. Ducks, geese, chickens, goats and a peacock roam freely keeping the dry, dusty yard free of bugs and organic matter. As I said already, there is a water problem. Apparently, about 5 years ago, there was municipal water from taps in the yards. The family put in a bath house, with flush toilets and a shower/bath room. The yard had green grass that had to be mowed! The water system failed and now water is brought in by trucks to big green containers (JoJos) and shared in neighborhoods. The family uses a latrine (outhouse) now like everyone else around here. I heard from one of the boys that the geese eat snakes and make lots of noise at night if there is an intruder. Good to know! My host family is so kind and have been very welcoming. The dad is a policeman and the mom works at the local circuit office (education). Dad is a polygamist and has at least 4 wives and 9 children. My host mom lives here and is the birth mom of two, a boy and a girl, but considers them all her children. The children go back and forth easily to various households. She and I have talked a bit about the marital situation since this quite legal arrangement is new to me and I’m curious. Apparently, it is illegal for a woman to have more than one husband. I met my principal (Mrs. N.) on Thursday at a meeting in Manguzi. All the Ingwavuma and Manguzi volunteers were treated to a night in a lodge with a bar, a swimming pool, and showers!!!!!!!! It is a lovely thing to be able to take a shower and wash your hair with unlimited hot water coming from above your head. What an incredible invention! The next day we all met our principals and discussed joint Expectations and Peace Corps requirements. We said goodbye to our friends of 2.5 months and drove off (with our suitcases, water filters, mosquito nets, some household items) with our principals to our new villages and homes. Most of us stopped along the way for essentials for our first night. The principal picked me up at 7:15 a.m. Friday morning to drive me to school the first time. I was introduced to the teachers and staff in a brief meeting. I hope I can live up to the hype she gave me of what I will bring to their school! They were so welcoming! Mrs. N. remembered to tell them some advice from the previous day’s Peace Corps meeting–Americans wait to be invited to events; in black South African culture there are no invitations–everyone is welcome! I was also introduced to the “learners” at morning assembly in the yard. It is a dusty, poor school, with not enough space for 472 learners. Some kids had no shoes, their uniforms were raggedy, and some get their only meal of the day at the state-provided feeding scheme about 10 a.m. The “office” is also the library, staff room, and principal’s office (corner). In the afternoon, I went to Jozini (my shopping town) with one of the teachers, in her husband’s pickup truck. I purchased most of the things on my list to make my new home comfortable for the next two years: a stove, a fridge, mop, broom, pots, pans, dishes, extra cord of plugs, silverware, iron, sleeping bag, buckets, and some food! By the end of the five hours, my shopping stamina was way over-taxed and I just needed to be home, settling in and nesting! I was able to hook everything up on my own (!!!!!). I was apprehensive about my first weekend home alone after so much togetherness. It has been great! Time alone to put things away, wash, iron, etc. and time with four little neighbor kids (from my school) who came by to play, sing and dance with me (see photo). And today, at midday, in the hot sun, I went on a 2.5 hour walk to view my nearest clinic in a “nearby” village. Two of my host family’s children walked with me! I had no idea it was that far! I met the two nurses there. They said they see 100-300 people/day, mostly for HIV/AIDS medication, diabetes, hypertension and mental illness. I came home, took ibuprofen (Vitamin I), did some laundry, wrote this blog and made some lentil soup. This is my new home folks! Come visit! There is room for a few mattresses on the floor! Peace Corps Training is winding down. Next Monday, September 15, 2014, 34 volunteers will be sworn in at the Tribal Court building in Ezudolini where we have been meeting for classes 2-3 times/week. We are finishing our Language Proficiency Interviews this week, getting additional medical and safety instructions, and hearing about what will be required as newbie volunteers at site. On Saturday, September 13, we are hosting a Farewell Function for the open-hearted families who allowed us into their homes and families for the last two plus months. There will be food, speeches, many thank yous, and entertainment. We are kind of like rock stars around our villages. People are happy to say “Sanibonani” or Sawubona” all the time. Children yell at us across their yard, “Hello, How are you? I am fine.” (They have no idea what comes next.) Last Friday, our M_____ moms rented and decorated a tent, cooked delicious food, and gathered entertainment (adorable little girls dancing and singing traditional Zulu dances and songs) for the volunteers staying in their homes. There were prayers and speeches and songs. We were thanked many times for teaching in South Africa (only English Clubs so far but anticipating the future teaching). We were praised for our good behavior (better than their own kids!) and the respect we have shown them and that our stay in M_____ has been entirely without police involvement in any incident whatsoever. Their praise was overwhelming! At the same time that we are feeling sad about leaving these wonderful people and the rural villages, we are quite ready to live on our own at our new sites. We are tired of being herded around in 16-person taxis, being told how to dress and behave, of doing everything in groups, being in language classes, being in how-to-teach sessions (tech), taking exams and writing assessments, doing pair/share, dividing into discussion groups and reporting back, learning about monitoring/reporting/evaluation, learning about how to stay safe from sexual predators, getting medical advice and cultural hints, and being perpetually dusty. At the same time that we are exhausted from all of the above, we are anticipating being separated from newly-made friends, and going to live on our own. I imagine it will be a shock after such togetherness and busyness of the last months. We will be strangers in a new community. We will attempt to speak isiZulu. We will be next-door-to but not in the house of a host family. We will be observing and integrating at our assigned primary schools but most likely not teaching until January when the new school year begins. What will we do with ourselves? What will I do? There will be lots of free time! I will let you know! Today I went into Vryheid by myself. I hailed the taxi by the side of the road, didn’t have to wait, was probably the last to board the very crowded van, sat squished against an uncomfortable metal bar, and helped to pass money forward and back as passengers paid just outside of eMondlo. I was the only white person in the taxi and it was all fine with all of us. I did my errands in town and ran into volunteer friends to hang out with. I was invited by two volunteers to go with them to visit an Afrikaaner family at their lovely home. Here is the amazing part: they offered to let me take a shower in their bathroom! I was almost crying! You know, indoors, warm water coming down from above your head, continuously, long enough to wash your hair! Wow! What an amazing treat! Think about how fortunate you are when you step into your shower each day! On the way home, I didn’t have to wait long at the taxi rank by Shoprite by the tree. Again, I was the last to board and it was iffy as to whether I could fit anywhere. I finally squeezed into the back row between two very large women and we sweated together in the afternoon heat all the way back to Mvuzini. Oh yes, there’s an entertaining You Tube video called “Poop in a Hole”–an accurate parody on Peace Corps life! Watch it!